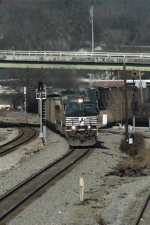 Description: NS 9317 and NS 3311 bring this Q562 though Owensboro on an ugly day. Description: NS 9317 & 9801 leaving Enola Yard passing switching operations. Description: Here's a surprise, another NS widecab dash unit on the lead of a freight on the Lake Shore Line. 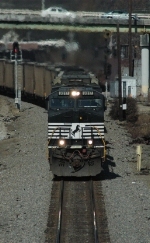 Description: Westbound NS unit coal train 503 rounds the curve at Wyomissing Jct. splitting the signals on a fine afternoon. Title: NS 9317 NS 20K 9:54 A.M. 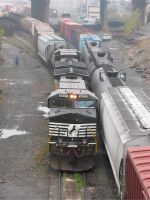 Description: NS 567 with a trio of Dash 9's is taken west. Description: WB Ethanol Train, 1810 hours. Description: NS 202 will hold at CP Bound Brook to wait for NS's 21M to pass on the main. Description: A westbound mixed bag emerges from the fog approching the signal at 195. Description: After knocking the signal down this westbound mixed bag running "english" with the power "elephant" style blows for the Lewis Road grade crossing. Description: Resting during a crew change at Bristol Yard. Description: NS 9317 and a leaser are on the point of the 09/23/07 18N as it makes its way through South Plainfield NJ. Title: 11J W/ a CEFX unit. Description: This train came by just as I was pulling into the antique store parking lot to park, I grabbed a quick shot and a movie and then took some frames from the avi. Description: This train came by just as I was pulling in the antique store parking lot to park I took a quick pic and a then movie and grabbed some stills from the avi.